The toxin protein HigB restrains bacterial growth by ripping up ribosome-bound RNA. Emory scientists led by Christine Dunham, PhD are investigating how HigB functions, with the goal of better understanding how the antibiotic-tolerant "persister cell" state is regulated. Scientists call them toxins. But these bacterial proteins don't poison us, at least not directly. Instead, they restrain the growth of the bacteria that make them, establishing a dormant "persister cell" state that is tolerant to antibiotics. Researchers at Emory University School of Medicine have obtained precise pictures showing how a toxin protein, called HigB, recognizes and rips up RNA as part of its growth-inhibition function. Their findings could lead to a better understanding of the formation of persister cells and how they maintain themselves. The results were published online on October 27 in Proceedings of the National Academy of Sciences. "Persister cells survive antibiotic treatment, even though they don't carry genes for antibiotic resistance," says senior author Christine Dunham, PhD, assistant professor of biochemistry at Emory University School of Medicine. "We used to think of them as just dormant cells that had just stopped growing. But it looks more and more like persistence is an actively maintained state. By looking at how HigB functions, we gain insights into how persistence is controlled." The first author of the paper is Marc Schureck, a graduate student in the Biochemistry, Cell and Developmental Biology program. HigB was first identified in Proteus vulgaris, a major cause of urinary tract and wound infections, but is also found in several other disease-causing bacterial strains. The HigB protein cuts up messenger RNA transcripts, which are instructions for making proteins. 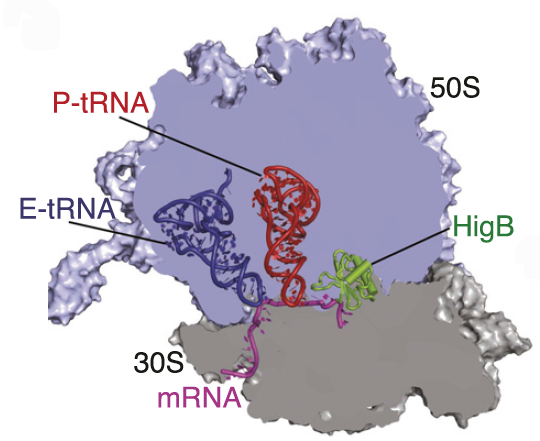 Using X-ray crystallography and biochemical studies, Schureck and his colleagues examined how HigB recognizes messenger RNA and how it interacts with ribosomes, the protein factories programmed by messenger RNA. "We can see that HigB doesn't degrade all RNAs equally well during stress; it's exquisitely selective, which we think could change the set of proteins the bacteria will have on hand for survival," Dunham says. "The prevention of a persister state would be a new antimicrobial strategy that could be used in adjuvant therapy in combination with antibiotics." The research was supported by the National Science Foundation (MCB0953714), the National Institute of General Medical Sciences (individual grant to Schureck: GM108351) and the Pew Charitable Trusts. X-ray studies were performed at the Argonne National Laboratory's Advanced Photon Source.